If you’d told me six months ago that my entire diet and lifestyle was about to change I wouldn’t have believed you! If you’re anything like me you’ll talk about wanting to be fit and healthy; you might even join the gym, google what to do with Kale, and start reading the back of all the food packets in the local supermarket. However, also like me, this newfound excitement about green smoothies and running machines will fade once you walk past the fish and chip shop on a Friday night! For a long l-o-n-g time I’ve played around with my diet. I love meal planning and getting organized, and I follow incredible bloggers (like Esme) and Instagrammers who share fabulous recipes and regimes, but I’ve never been able to make changes that stick. I start with great enthusiasm but get tripped up by ‘life stuff.’ It’s bizarre how my relationship with food is such a rollercoaster when I can be ruthless with my motivation in other areas. As it happens, making drastic changes to my diet and lifestyle became urgent as I struggled with an autoimmune disorder. Inflammation in my joints has been causing me an incredible amount of pain for the last three years. My depression and anxiety have been off the charts, and my body feels like an alien being has invaded. I’m exhausted all the time, overwhelmed by the simplest of tasks, in constant pain, and feel like I’m wading through treacle. Getting out of bed (after another night of no sleep) is a joke as I have to inch my way to the edge and try to get my joints working before I can sit then stand. I’m 46 years of age but feel like a 90-year-old! I decided enough was enough and I needed to take control, so I booked to see a nutritional therapist. We put together an elimination plan which would significantly reduce my symptoms and reverse the inflammation in my joints. For four weeks I wasn’t allowed wheat, gluten, eggs, dairy, soya, peanuts, tea/coffee, or red meat. Once the month was over I would then be allowed to reintroduce food groups to see if my symptoms returned – if they did, I would need to cut that food group out of my diet. The entire process has been incredible, and I’ve learned so much about myself, my relationship with food and the impact my health has on self-esteem as well as physical and mental health. The detoxification process was horrific, and I shared this experience on my author blog, but once that initial period was over, I began to see amazing results. My energy levels soared, and I started to sleep better. The constant brain fog lifted, and I began to feel human again. As well as all the wholesome foods, I also take a food supplement which works directly on the inflammation in my joints which have started to improve. I’m enjoying cooking again. Peppermint tea has become my new go-to drink of choice, and I don’t miss all the unhealthy snacks I used to eat. Here’s a quick peek at some of the meals I’ve been eating. 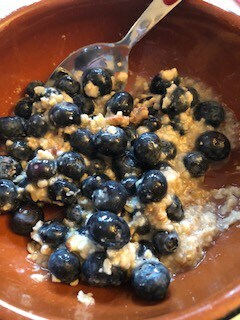 Gluten-free porridge oats with almond milk, pecans, blueberries, and organic honey. Heat milk and oats in a pan for 5-7 minutes and when cooked add nuts, honey, and berries. Bring 480ml water to the boil and stir in the quinoa. Reduce heat and simmer for about 12-15 minutes until most of the liquid is absorbed. Uncover and set aside to cool. In a large bowl, whisk vinegar, lemon, and lime with sea salt and pepper. Slowly add olive oil and fresh chopped herbs. Mix well. 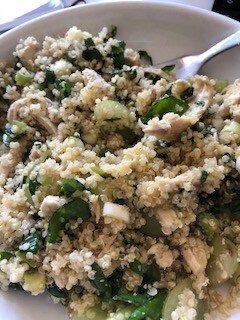 Add cooled quinoa to dressing and toss. Add chicken, grapes, nuts, chopped baby spinach and spring onions and toss again. Serve at room temperature or chilled if preferred. 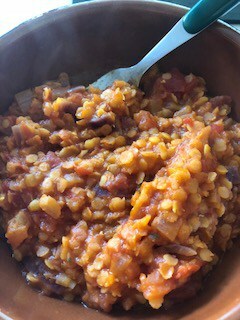 Lentil and tomato soup (consistency of a broth and VERY tasty). Taken from Madeleine Shaw’s book – Get the Glow. 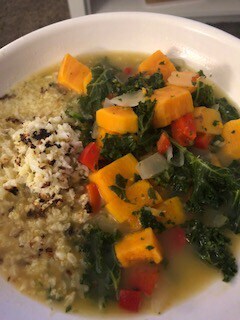 Kale and squash soup with cauliflower rice. In a heavy pot, add onion, garlic, red or yellow pepper, squash and stock. Bring to the boil. Reduce heat and simmer for 5 minutes. Add coconut milk and kale and cook for 3-4 minutes. The soup is ready when all the vegetables are soft. 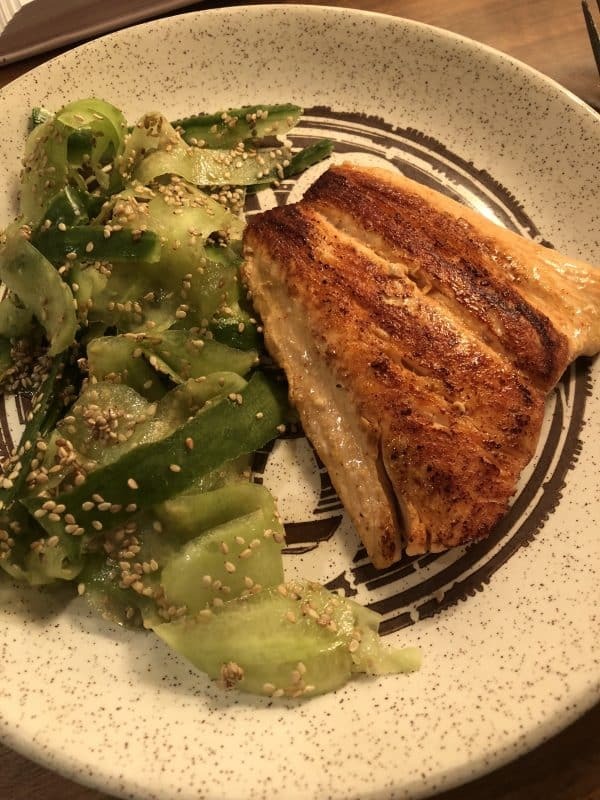 Grilled salmon fillet on a bed of sautéed courgette and sesame seeds. The reintroduction of food groups has been interesting, and so far I’ve only had a bad reaction to bread (gluten/wheat) and a slight irritation to eggs. My entire way of life has changed to accommodate this new gluten-free lifestyle. I have to think before I eat, look up menus before going out for dinner, and be organized when out at meetings, events, or traveling. Yes, it might sound like hard work, but I’ve found it much easier to adapt than I thought I would. I now seek out gluten-free restaurants, buy organic vegetables whenever possible, and I’ve cut out all the processed foods that had become regular purchases on my food shop. My free-from journey is still only just beginning but thanks to all the positive changes I’ve seen so far it’s a journey I’m happy to be on. I’m sharing all my restaurant reviews, free-from articles, recipes, and highlights on my personal development blog which you can find HERE. Thanks, Esmé for allowing me to share my story on your remarkable blog. I shall be looking out for all your gluten-free recipes! 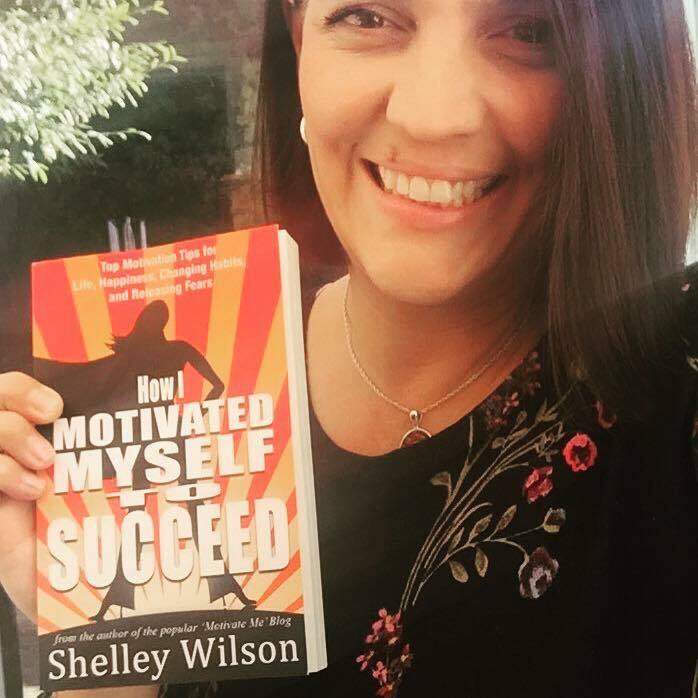 Shelley Wilson was born in Leeds but moved to the West Midlands when she was a youngster. She is a single mum to three teenagers and a crazy black cat called Luna. Her favourite things are vampires, mythology, history, and cooking. Shelley is an avid reader and blogger with a passion for Netflix binge watching sessions. She divides her time between blogging and writing motivational non-fiction books for adults, and the fantasy worlds of her YA fiction. O get this. I’m intolerant of white break and yeast, horribly allergic to certain shellfish and grateful I gave up all alcohol 30 years ago. Through my son I now eat a lot of vegan dishes and avoid as much processed food as possible though eating crisps remains the ultimate guilty pleasure. Love the recipes and good luck with all the changes Shelley! WOW, this is a lot of stuff, but glad you figured them out and still am a happy camper. I am not fully vegetarian or even close to vegan but with my son and his family being vegan I enjoy a lot of vegan dishes and just love preparing them. I will not say I will ever be fully vegetarian, but I am getting close to it. Just love the fact that I feel so much better in general. Thanks, Geoff. It’s amazing how quickly you can adapt when eliminating food (or drink) from your diet. I’ve been tee-total for four years now and don’t miss it. This is so up your ally Carol. Yes, I agree, eat healthy and stay healthy. Eat junk and you will feel like junk …. These recipes are so nice and healthy!